Walk into the Canada Immigration Seminar and directly land to Canada with our guidance. The seminar is conducted by Mr. Ravi Iyer who is a member of ICCRC and authorized consultant Quebec Immigration. This Seminar will provide you customized solutions for your Canadian immigration needs. This is all about PR / Job in Canada like (Nursing, Pharmacy Technical Assistant, Welding & Fitting). We have helped many clients from around the globe to obtain landed immigrant (permanent resident) status, and temporary status by representing them effectively to the Citizenship and Immigration Canada. The Seminar will be on 3rd & 4th December in New Delhi. The Benefits of attending the Seminar is that you will get on-spot assessment, on-spot discount. 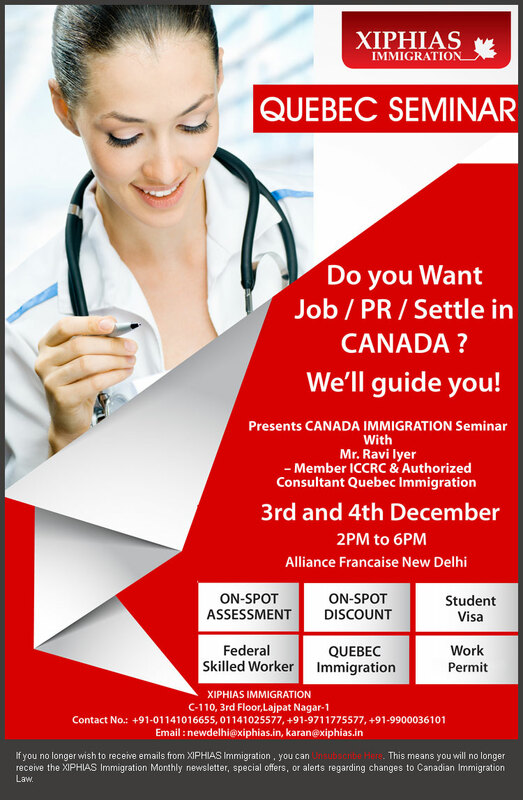 Attend the seminar with Your Updated Resume and get the benefits to fly to Canada as pr /student or with work permit. “All the best …hope you are ready for post University trauma” – were the very last words of an English dean of my University shot at me, at that very moment I thought my move to London for a job should be just another move. Considering the fact that I hail from a country with an estimated population of about 1.2 billion what will a city that is probably marketed to be a tourist spot for the travellers and a financial hub for the rest be of any hassle to me. Boy… O… boy was I in for a surprise; London is everything and more that my tiny brain could envisage. Fast cars..slow traffic..good food.. high prices…music..loud…extremely busy…modern..aesthetic and much more. Everything in London to me seems to be on a constant diet of energy drinks. Everyone’s in a rush to get somewhere and is relentless about it. I like it …in fact I liked it so much that I have decided to stay, work, explore and experience London to its fullest. So I have seen and experienced quite a few places and have picked my three best spots to share with you. Situated on the Greenland dock at Surreys Quays, this little boat pub is a great find for me. It has everything that I need to make my Sunday evenings feel just right after a long week. A cosy pub with extremely friendly staff that hosts a karaoke on Sunday evenings and also a pub quiz on Thursday. Prices at the bar are very reasonable (12 Quid for a bottle of wine!). The crowd of regulars here is the kind you would look forward to seeing every week. A funky 78 year old who in his tailored suit makes you feel some people should sing and some should not, yet you would see him smile and grab the mike every few minutes, Oh god. The boat is docked at just the right spot tucked away from the mad hustle of the city, although it may take a bit of finding through narrow lanes that lead you on to a very beautiful pier scattered with stunning boats and mini yachts. This place definitely did it for me and my friends. This spot is an absolute favourite of mine, located in the heart of the city at a short walk from the Liverpool street station. Since the market is located at a short distance from my office, it gives me a chance to grab some real good food at lunch whilst I scan through very unique place. The old spital field markets hosts a fusion of fashion, antique and weird contraptions people make and collect to sell at the open stalls that usually have Jimi’s songs blaring through old collectables record players. The place has so much to offer that it has often come to me as a saviour, whether I need to find inspiration for my hobbies or it is to do some economical spending on gifts for friends and family. After a long day at work I like to go somewhere and sit down and relax a for a few minutes before I can head out back home to a very busy share house hold of two Asian couples, a baby and a confused Czech flatmate. I have been a very lucky chap to have been working at an office that is bang on the banks of river Thames facing one of the most popular tourist destinations in the world, the infamous London Bridge. Yes, expect the whole shebang: beautiful view, colourful, modern buildings, crazy party cruises going by, excited tourists and the ever busy Londoners walking up and down the bridge to catch the next tube. The spot on the bridge is no doubt one of the best places to stand and click away to glory but I prefer to walk through Swan lane which gives one access to the bank side, under the bridge. I like to spend some time to wind down, catch some fresh air and reflect on the day.